The north face of the Eiger from the backyard of our apartment in Grindelwald. A gondola ride to First (said "fearst"), and I was a looking at this view a few minutes before jumping off. Left to right this is Wetterhorn (3692 m), Schreckhorn (4078 m, pointy in the back), Eiger (3970 m). This was absolutely the highlight of my whole time in Switzerland. Floating peacefully in front of that view and waving to people in mountaintop restaurants was amazing. I didn't find takeoff scary at all, basically I ran down the steep hill until the harness took my weight and I was in the air. Dino was hanging out on my left during takeoff due to the direction of the wind. Once we were up I could sit back into the harness, which is actually a comfortable chair, far more comfortable than hanging in a rockclimbing harness. It was warm that day, which meant for a fairly short flying time (~20 mins). The longest flying times are achieved when it is warm in the valley and cold up high, usually the mornings. "Let me know if you see any birds, we follow them to catch the updrafts". I asked Dino what his longest flying times and distances were. I can't remember exactly what he said but the answers were around 11 hours and several hundred km (separate trips). "You need to bring your passport and euros". This is a pretty awesome hobby. He estimated I could have flown myself in the easy conditions that day after just a couple of days of instruction. Gear costs are about $3k to get started. As we started to get close to the landing point Dino asked if I liked roller-coasters and if I wanted "the fast or the slow way down". I foolishly said "the fast way" and spent the next few seconds with my guts in my mouth with that weightless roller-coaster feeling. He pulled hard on one side of the control strings, then the other as we dropped altitude quickly. The landing itself was really calm and not scary: basically it just involved putting my feet down and taking a few steps. Loved it. 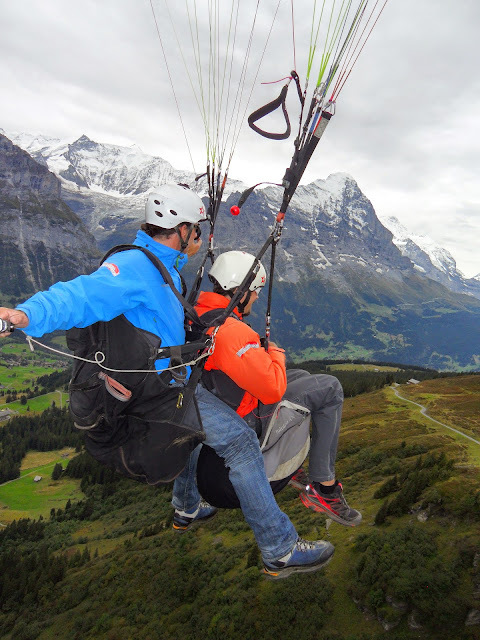 The outfit was Paragliding Jungfrau, and they were great. I called the morning I wanted to fly and they fitted me in.